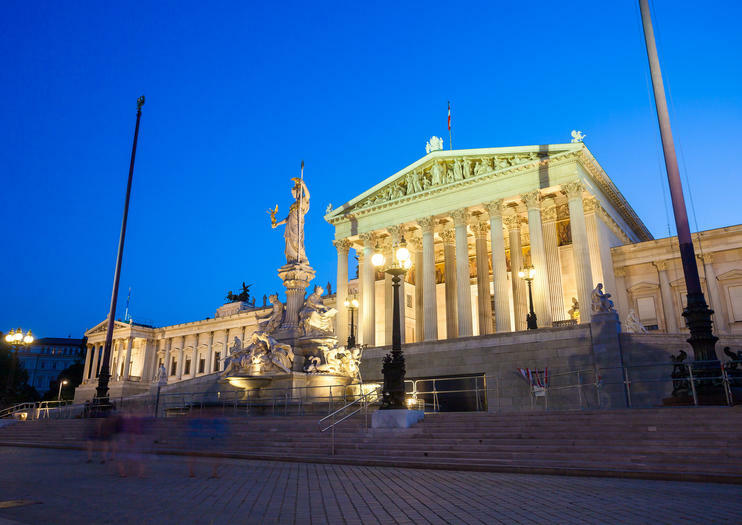 The Austrian Parliament Building, a Greek-revival style building completed in 1883, is where the two Houses of the Parliament of Austria conduct their sittings. It is located in Vienna’s city center, close to the Hofburg Imperial Palace and the Palace of Justice. Despite sustaining heavy damages during WWII, most of the building’s interior has been restored to its original impressive appearance. The parliament building is one of the largest structures on the Ringstraße. It was originally built to house the two chambers of the Austro-Hungarian Empire’s Reichsrat (Austrian legislature). Today, it is the seat of both the Nationalrat (National Council) and the Bundesrat (Federal Council). The building contains over 100 rooms, including the chambers of the national and federal councils, the former imperial House of Representatives, committee rooms, libraries, lobbies, dining-rooms, bars, and gymnasiums. It is a working government building, and the site of state ceremonies – most notably the swearing-in ceremony of Austria’s president and the state speech given annually on National Day (October 26). The Austrian parliament offers guided tours giving insights into day-to-day political work, historical details, and architectural features. The tours take about an hour, and are catered to different interests and age groups. Visitors wishing to access the parliament building on their own must have an appointment, and carry photo ID. Visitor Service staff is available for information and registration Monday – Friday from 9 a.m. – 3 p.m. The visitor’s center is open for the public free of charge Monday – Saturday from 9:30 a.m – 4.30 p.m. The parliament building’s working hours are Monday – Friday from 6.30 a.m. – 7.00 p.m., and Saturdays from 9.00 a.m. – 5.00 p.m. Spend a day in Vienna with the chance to tailor your itinerary and free from transport worries on this private tour from Budapest. Admire the scenery from a private air-conditioned car as you travel into Austria, and enjoy a panoramic drive and guided walk around Vienna’s imperial highlights. Later, choose to explore the Schonbrunn Palace, museums, or the city’s shopping avenues or other sights. Hotel pickup and drop-off are included. If you’re an independent explorer, but don’t want to deal with the hassle and unreliability of public transportation, enjoy a private self-guided tour of Vienna. After pickup from your Budapest hotel, your guide will take you to the Austrian capital by private car. Along the way, enjoy expert suggestions on what to eat and see. Then, you’re free to spend the day how you please, before returning to Hungary. Don’t limit your time in the Czech Republic to Prague — visit the elegant Austrian capital of Vienna on a private full-day trip from Prague. After a scenic drive through the Czech Republic’s gorgeous countryside, you’ll take a panoramic tour of Vienna’s top attractions: see the historic Vienna Opera House (Staatsoper), the Imperial Palace (Hofburg) and the Old Town Hall (Altes Rathaus). Then, purchase lunch and enjoy free time in Vienna’s beautiful historic center. On this private tour, you’ll receive undivided attention from your personal guide. Maximize your time in Europe with a day trip to Vienna from Prague. Private transportation picks you up from your hotel and transports you to the Austrian capital where you’ll enjoy a full seven hours of sightseeing. You set the pace as your private guide leads the way. Visit major attractions including St. Stephen’s Cathedral and the Hundertwasserhaus. Finally, unwind as your private transport returns you to your hotel. The Austrian capital of Vienna is renowned for its imperial history and UNESCO World Heritage-listed historic center. On this full-day tour from Ljubljana, enjoy comfortable round-trip transport by minivan and benefit from a small group size. In Vienna, visit the magnificent Schönbrunn Palace, drive the famous RingStrasse, and admire landmarks such as St. Stephen’s Cathedral on a guided walking tour, then enjoy some free time to explore independently.